Semiconductor photocatalysis is an advanced oxidation process for the degradation of organic pollutants in wastewater. TiO2 is an excellent photocatalyst under UV light but it absorbs only a small fraction of visible light. One way in which to extend its light absorption spectra is to couple TiO2 with a narrow band gap semi-conductor like β-Bi2O3. Indeed, the low value of the band gap thus located (2.3 eV) means that they can absorb a greater part of the visible light than the titanium dioxide alone. The aim of this work is to optimize the facile synthesis of β-Bi2O3/TiO2-P25 heterojunctions and to evaluate the photocatalytic activity of the prepared composites in regard to the photodegradation of Orange II under visible and UV light. As we explain in the first part of this work , titanium dioxide and especially its anatase crystalline form, is the most popular photocatalyst. However, TiO2 as a photocatalyst can only be excited by UV light (shorter than 390 nm). It absorbs only a small fraction of visible light (about 3% of the solar spectrum on Earth) . There are several solutions making it possible to extend the light absorption spectra of non-porous titanium dioxide to the visible region. From among these methods, we chose to couple TiO2 with narrow band gap semi-conductor (such as CdS, WO3, SnO2). Bi2O3 is a p-type semiconductor that has four main crystalline structures. Over the last decade, bismuth oxide based catalysts have been reported in many publications as very good candidates for environmental photocatalysis . Indeed, the relatively low value of the band gap (2.8 eV) means that they can absorb a greater part of visible light than titanium dioxide. They are able to oxidize water and generate highly reactive species such as OH° and O2°, and thus initiate oxidation reactions. Very recently, it was found that the β-Bi2O3 phase had a very small band gap (2.3 eV) and that it could therefore absorb visible light up to 540 nm 6-8 . However several problems limit the applications of β-Bi2O3 in heterogeneous photo-catalysis . In one regard, β-phase is the metastable phase, which is easily transformed into Bi2O2CO3, but in another regard the quantum yield is low and the recombination of the photo generated species (e- /h +) is relatively fast. However, TiO2/Bi2O3 coupling can stabilize β-Bi2O3 and thus solve the problems of low photocatalytic efficiency. The TiO2 heterojunction with another semiconductor with a narrower band gap than bismuth oxide, causes a displacement of the TiO2 absorption spectrum in the visible region (red-shifts), because of the photosensitizing effect of Bi2O3 . These kinds of heterojunctions also promote the separation and the transfer of photo generated charges and increase the efficiency of the photocatalytic materials . The aim of this work is to optimize the facile synthesis of β-Bi2O3/TiO2-P25 heterojunctions and to evaluate the photocatalytic activity of the prepared composites for the photodegradation of Orange II under visible and UV light. The typical synthesis consists of introducing an appropriate weight of β-Bi2O3 in 40 mL of absolute ethanol into a three-necked flask, then 0.2 g of maleic acid dissolved in ethanol is added to the slurry of bismuth oxide. After a few minutes of stirring, 1 g of TiO2-P25 (Evonik) is added to the mixture. This mixture is placed under vigorous stirring for 6 hours and is then washed with ethanol to remove excess maleic acid. The product thus obtained is dried at 60°C overnight and calcined in an oven at 300°C for 3 h . Equally, to show the formation of the real heterojunction, TiO2-Bi2O3 mixtures at different proportions can be prepared by simple grinding of the two oxides in a mortar. Note that the β-Bi2O3 preparation method has been optimized in previous work . X-ray diffraction patterns were obtained with a D8 Advance Bruker diffractometer, in a q/2q mode and using the Kα radiation of Cu at 1.5406 A˚. The diffused reflectance spectra were performed with a Varian CARY 4000 UV-Vis equipped with DRA900 integrated sphere. Surface area and porosity measurements were carried out on a ASAP2010 Micromeritics Tristar apparatus using N2 as adsorbent at liquid N2 temperature. Before N2 adsorption, the material was out gassed under primary vacuum at 200°C overnight. The specific surface area was calculated from the N2 adsorption isotherm using the BET method. Transmission electron microscopy (TEM) was performed on a Topcon 002B microscope working with a voltage of 200 kV and a point-to-point resolution of 0.17 nm. The sample was sonically dispersed in an ethanol solution before a drop of the solution was deposited onto a copper grid covered by a holey carbon membrane for observation. To investigate the degradation performance of the photocatalytic materials, batch mode experiments were conducted at ambient temperature in a glass cylinder reactor with an aqueous solution of Orange II (a dye) under UV-Visible and Visible irradiation. The ATLAS Suntest CPS and a solar box simulating natural radiation and equipped with a vapour Xenon lamp was used in all experiments. We also performed dye degradation experiments using visible light only. In that case, all the experimental parameters were the same except for the fact that the UV part of the light was reduced by means of a 3 mm thick GG420 filter (Schott) placed on the photoreactor (β>420 nm). Photocatalytic heterojunction powders were immersed by means of stirring in a volume of 200 ml of Orange II aqueous solution (CorangeII=50 mg/l). Before each irradiation, the liquid suspensions were kept in the dark for 30 min in order to reach the adsorption equilibrium. During the irradiation procedure, 4 ml of the solutions were sampled at regular time intervals and filtered (Whatmann, 0.45 mm). The remaining concentration of Orange II was determined with a LIBRA S12 UV–Vis spectrophotometer (β=484 nm). The Bi content in the Bi/TiO2 composites was obtained by Atomic Absorption Spectroscopy performed at the ‘Plateforme d’Analyse des Inorganiques’ of the “Institute Pluridisciplinaire Huber Curien”, Strasbourg (France). Bi/TiO2 materials were experimentally loaded with 1 wt.%, 5 wt.%, and 10 wt.% of Bi displayed contents of 0.95 wt.%, 05.22 wt.% and 10.02 wt.% respectively. TiO2 has a band gap of 3.2 eV (βmax=387 nm) in its anatase phase and 3.0 (βmax=413 nm) in its rutile phase. As a result, they are too large to absorb visible light, thus pure TiO2 will be inactive from β>420 nm . If we compare this with the prepared Bi2O3-TiO2 heterojunctions, the absorption spectra are shifted to areas of lower energies (Figure 1). All prepared heterojunctions show a response in the visible area due to the photosensitizing effect of Bi2O3 as we have already shown in the previous work . Thus, we observe two contributions: the first around 400 nm fits with the absorption of UV-A irradiation by the TiO2 anatase and the second around 450 nm corresponds to the visible adsorption by Bi2O3. Moreover, the visible light absorbance increases with the Bi/Ti ratio, which was reported by Bessekhouad . Figure 1. UV-vis diffuse reflectance spectra of β-Bi2O3, TiO2 and Bi/TiO2. Spectra show the presence of the main diffraction peaks of TiO2 (anatase and rutile) and of β-Bi2O3 (Figure 2). There is no peak corresponding to by-products, which suggests no chemical reaction produced during the heat treatment at 300°C. Thus we have peaks of β-Bi2O3 phase, which are present even in composites containing 5% of bismuth oxide. In this situation, we can assume that the Bismuth oxide is well distributed on the TiO2 surface (regardless of the Bi /Ti ratio) as shown in the TEM images (Figure 3). Figure 2. XRD patterns of β-Bi2O3, TiO2 and Bi2O3/TiO2. Figure 3. 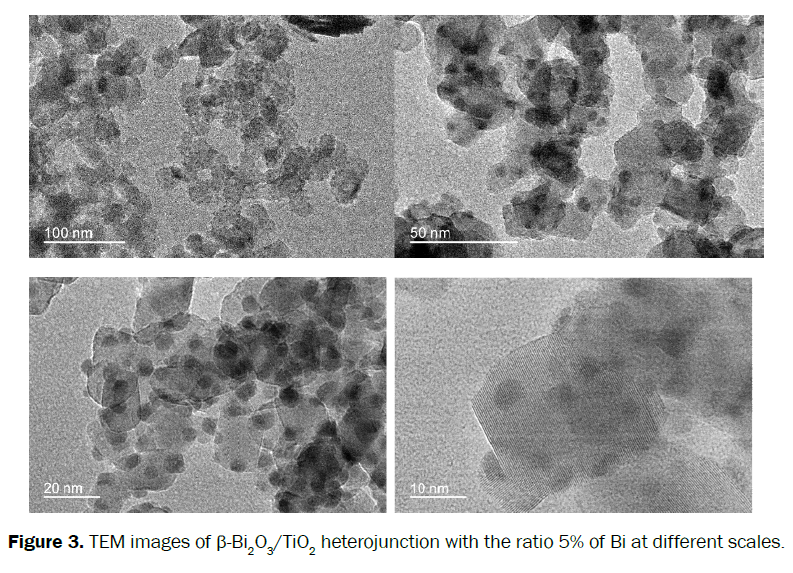 TEM images of β-Bi2O3/TiO2 heterojunction with the ratio 5% of Bi at different scales. Figure 3 shows the TEM images of 5% Bi2O3/TiO2 heterojunction. 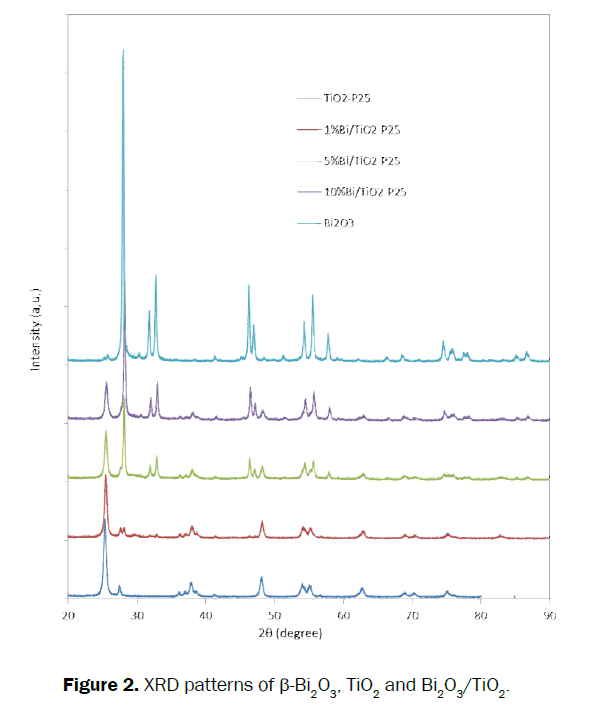 We note that the TiO2-P25 crystals have an average size of about twenty nanometers with a spherical shape confirming calculations from the XRD analysis. The particles were partially agglomerated, using this method of preparation. The images show the presence of Bi2O3 spherical nanoparticles with an average diameter of 5 nm uniformly distributed on the surface of the TiO2 particles. The BET surface area is an important parameter in determining the photocatalytic activity of the nanoparticles. It is important to have mesoporous nanoparticles in photo catalysis because they allow the passage of reactants and products in the catalyst. The size and pore volume were calculated using the Barrett Joyner Halenda (BJH) method. The BET surface area and pore volume decreased while the pore size increased together with the ratio Bi / Ti as in Figure 4. The shape of composite insulated adsorption could be attributed to the type II with negligible hysteresis, which is characteristic of essentially non-porous materials such as P25 . For this series of materials it will be the "electronic effects" that will induce a significant difference in reactivity rather than the surface properties. All the more so, because particle size distribution shows no maximum, confirming the non-porous nature of these composites. Scheme 1. Preparation of Bi2O3/TiO2 heterojunction. Figure 4. 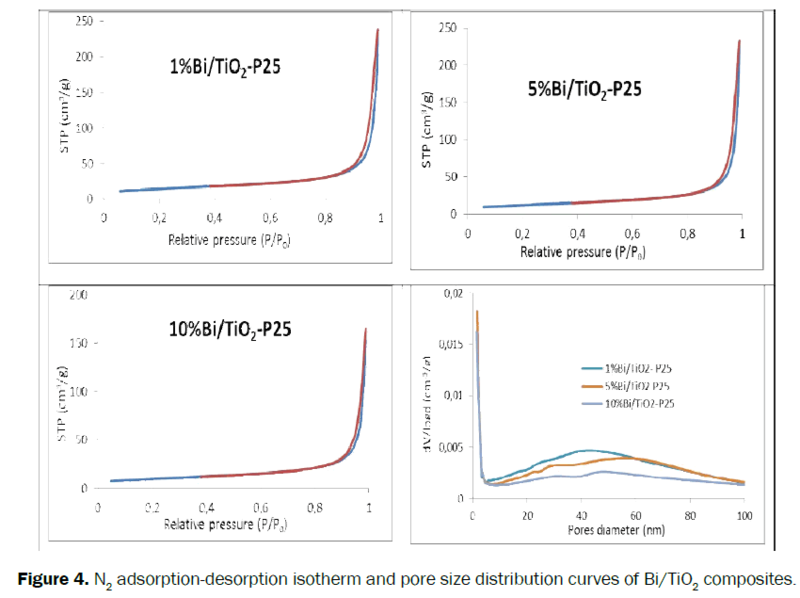 N2 adsorption-desorption isotherm and pore size distribution curves of Bi/TiO2 composites. The method we have developed in previous work [12-15] does not produce the expected results when performed under visible irradiation. We opted for another technique which consists of direct mixing of the two oxides. However, as shown by preliminary tests (Figure 5), it is not sufficient to mix together Bi2O3 and TiO2 nanoparticles in the mortar to create an heterojunction. In Figure 5, the photocatalytic performance under UV of the prepared Bi2O3/TiO2 mixtures are almost identical to that of TiO2-P25 alone. While this mixture is inactive under visible light (β>420 nm), it is thus necessary to add a binder before heat treatment to create an efficient heterojunction. Most recently in 2014, Chakraborty et al. used maleic acid (MA) as a binder to prepare heterojunction Bi2O3/TiO2. The role of the maleic acid is to chemically combine the two oxides using the two acid functions of the diacid molecule as in Scheme 1. Figure 5. Photocatalytic degradation of Orange II using mechanical mixture of Bi2O3 (5 mg) and TiO2 (95 mg) under UV and Visible irradiation. 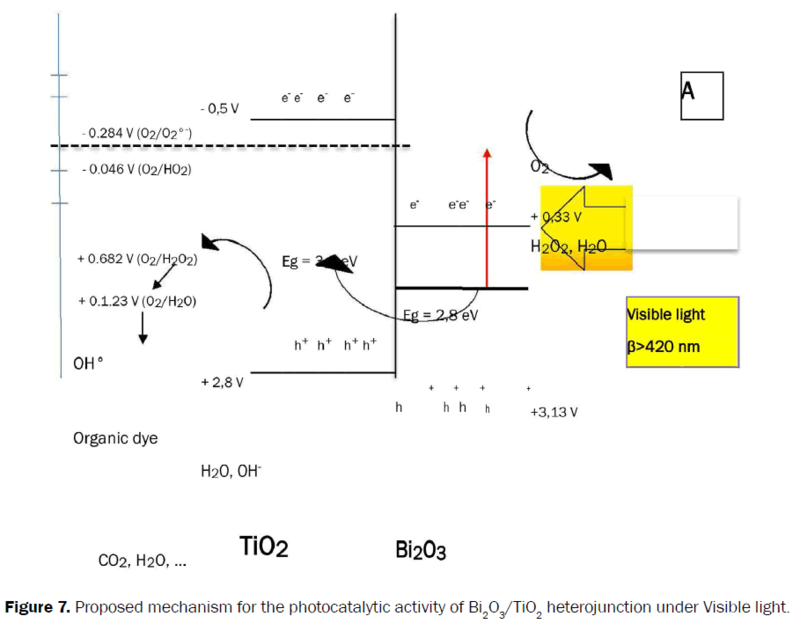 Figure 6 shows the results of photocatalytic degradation of Orange II with Bi/Ti heterojunction prepared with maleic acid in the UV-Vis (Figure 6a) and visible ranges (Figure 6b). We can deduce that the optimum degradation of Orange II in the UV-Vis ranges is achieved for the composite 5% Bi/TiO2-P25, while the most effective rates in the visible range are achieved for heterojunctions with 5 and 10% Bi/TiO2-P25. The best composite of all prepared samples is β-Bi2O3/TiO2-P25 5% with a removal rate of Orange II at 100% UV-Vis and 80% in the visible ranges, after 220 min irradiation. Figure 6. 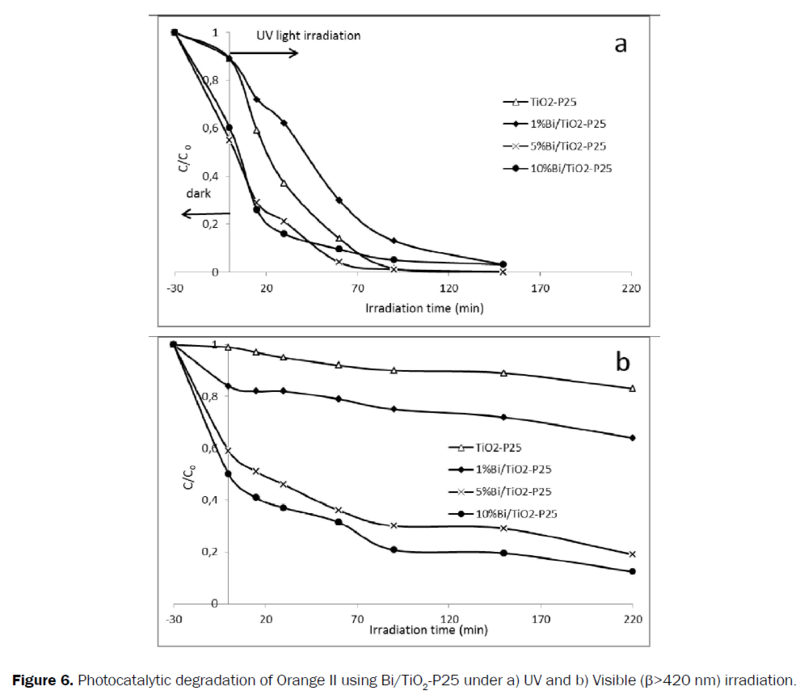 Photocatalytic degradation of Orange II using Bi/TiO2-P25 under a) UV and b) Visible (β>420 nm) irradiation. As we explain in the previous work [16-18], in the Bi2O3/TiO2 heterojunction, under visible light, the holes formed at the valence band of Bi2O3 are transferred to the upper valence band of the TiO2. The electrons of the conduction band of Bi2O3 react with the dissolved oxygen in water. According to , there would be an electronic interaction at the interface of two semiconductors (heterojunction) resulting in a transfer of charge carriers through this junction (Figure 7). The basic concept is that the photogenerated charges in the excited semiconductor (Bi2O3 if β>420 nm) can be transferred to the second, un-excited, semiconductor (TiO2). In this case, e-/h+ recombination is thus limited and the transferred holes will form hydroxyl radicals by reacting with H2O and OH- adsorbed on the surface of the two oxides. In this composite, titanium dioxide is the main photocatalyst, while bismuth oxide acts as adsorbent photosensitizer under visible light . Figure 7. Proposed mechanism for the photocatalytic activity of Bi2O3/TiO2 heterojunction under Visible light. 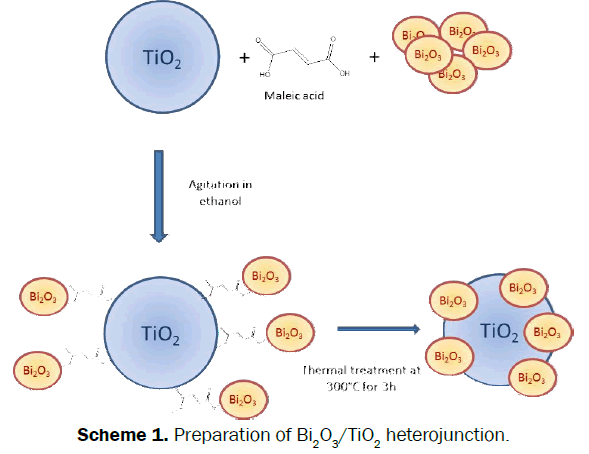 In this work we optimize the facile synthesis of β-Bi2O3/TiO2-P25 heterojunctions by direct mixing of the two oxides in the presence of maleic acid (organic binder). The photocatalytic activity of the prepared composites under visible and UV light has been evaluated in regards to Orange II. The best composite of all prepared samples is β-Bi2O3/TiO2-P25 5% with a removal rate of Orange II at 100% under UV-Vis and 80% under visible, after 220 min irradiation. It was observed that the heterojunction could absorb energy up to the visible region. It is therefore necessary to add a binder before heat treatment in order to create an efficient heterojunction because, if we mix together Bi2O3 and TiO2 nanoparticles without maleic acid in the mortar there is no photocatalytic activity under visible light (β>420 nm). The authors wish to thanks the French Ministry of Foreign affairs and the Embassy of France in Ivory Coast (Campus France Program) for their funding of the PhD research grant of Prisca AYEKOE. Serpone N, et al. Exploiting the interparticle electron transfer process in the photocatalysed oxidation of phenol, 2-chlorophenol and pentachlorophenol: chemical evidence for electron and hole transfer between coupled semiconductors. J Photochem. Photobiol. A: Chem 1995;85:247. Bian ZF, et al. Self –Assembly of active Bi2O3/TiO2 visible photocatalyst with ordered mesoporous structure and highly crystallized anatase. J. Phys. Chem. C. 2008;111:6258-6262. Liu Y, et al. Synthesis, characterization, and activities of visible light-driven Bi2O3-TiO2 composite photocatalysts. Journal of Alloys and Compounds. 2010;498: 179-184. Xiao X, et al. Facile large-scale synthesis of b-Bi2O3 nanosphere as a highly efficient photocatalyst for the degradation of acetaminophen under visible light irradiation. 2013; pp: 140-141. Zhu GQ. et al. Synthesis and photocatalytic performance of Ag- loaded beta-Bi2O3 microspheres under visible light irradiation Journal of alloys and compounds 2010;509:9479-9486. Yin LF, et al. Mechanism of reductive decomposition of pentachlorophenol by Ti-doped β-Bi2O3 under visible light irradiation. Env. Sci. Techno 2010;44:5581-5586. Huang QQ, et al. β- and α-Bi2O3 nanoparticles synthesized via microwave-assisted method and their photocatalytic activity towards the degradation of Rhodamine B. Matter Lett 2011;65:988-990. Li D, et al. Fabrication of bidirectionally doped β-Bi2O3/TiO2-NTs with enhanced photocatalysis under visible light irradiation. Journal of Hazardous Materials 2013;258:42-49. Bessekhouad Y, et al. Photocatalytic activity of Cu2O/TiO2, Bi2O3/TiO2 and ZnMN2O4/TiO2 heterojunctions. Catalysis Today 2005;101:315-321. Xu JJ, et al. Synthesis of Bi2O3-TiO2 composite film with high photocatalytic activity under sunlight IR radiation, Appl. Surf. Sci 2008;255:2365-2369. Serpone N, et al. Visible light induced generation of hydrogen from H2S in mixed semiconductor dispersions: improved efficiency through inter-particle electron transfer. J. Chem, Soc Chem Commun 1984; pp: 342-344. Ayekoe PY, et al. TiO2/Bi2O3 photocatalysts for elimination of water contaminants. Part 1: synthesis of Bi2O3 nanoparticles. Env Chem Let 2015;13:327-332. Yang J, et al. Visible Light Photocatalytic Performance of Bi2O3/TiO2 Nanocomposite Particles. Chinese Journal of Inorganic Chem 2011;27:547-555. Patil SR, et al. Alternate coating and porosity as dependent factors for the photocatalytic activity of sol–gel derived TiO2 films. Chemical Engineering Journal 2011;174:190-198. Ayekoe PY, et al. Preparation of effective TiO2/Bi2O3 photocatalysts for water treatment. Env Chem Let 2016;14:387-393. Beydoun D, et al. Occurrence and prevention of photodissolution at the phase junction of magnetite and titanium dioxide. Journal of Molecular Catalysis A: Chemical 2002;180:193-200. Malato S, et al. Decontamination and disinfection of water by solar photocatalysis: recent overview and trends 2009;147:1-59. Robert D. Photosensitization of TiO2 by MxOy and MxSy nanoparticles for heterogeneous photocatalysis applications. Catalysis Today 2007;122:20-26. Vinodgopal K and Kamat PV. Enhanced rates of photocatalytic degradation of an azo dye using SnO2/TiO2 coupled semiconductor thin films. Environ Sci Technol 1995;29:841-845.